my new ep will be released the 4th of july on every major web music store. 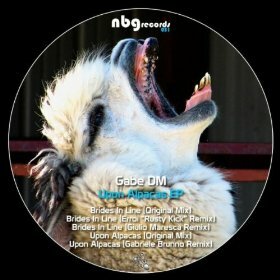 the ep will be out for NGB, an indepenedet label based in Rome headed by Gabriele Brunno which also partecipates in the release with one remix. I am really happy to release this Ep because I think is very unique, the orignal tracks are very eclectics and funny, lots of breaks and melodies close to progressive techno, very different form anything I released so far. Thanks Gabriele for giving me this opportunity. Brides in Line is build on a field recording I made in the park where i walk my dog, there are lots of kids playing and screming around a public fountain. Upon Alpacas is the titletrack of the Ep it’s a very tight and progressive tech house. here the forthcoming release for you to listen on JunoDownload before it’s officially out, I will soon add the tracks on my soundcloud. last thing: the Ep’s got mastered by Sebastian Fishbeck at Arktis Studio, who I thank a lot for all the stress I provide.